I've been working on some things behind the scenes, which hasn't left me much time to post. I'm still here and have a card to share with you today using the JustRite Lacey Tiers dies. The white base card is 5 1/2" x 5 1/2" with an embossed floral front. I then cut two frames using the Lacey Tiers borders and staggered them. They were glued together. The center stack is lily paper with a piece of Whisper White left over from the Lacey Tiers border. I added a Prima Fairytale purple rose to the center. Pearls accent the circular motif. Since this was for a 40th birthday, I stamped the number 40 in Pale Plum and embossed it. The Spellbinders Labels One were stacked and popped up. A triple loop bow was made from seam binding with a rhinestone brad in the center. The inside sentiment was stamped in Adirondack Purple Twilight and embossed with clear embossing powder. 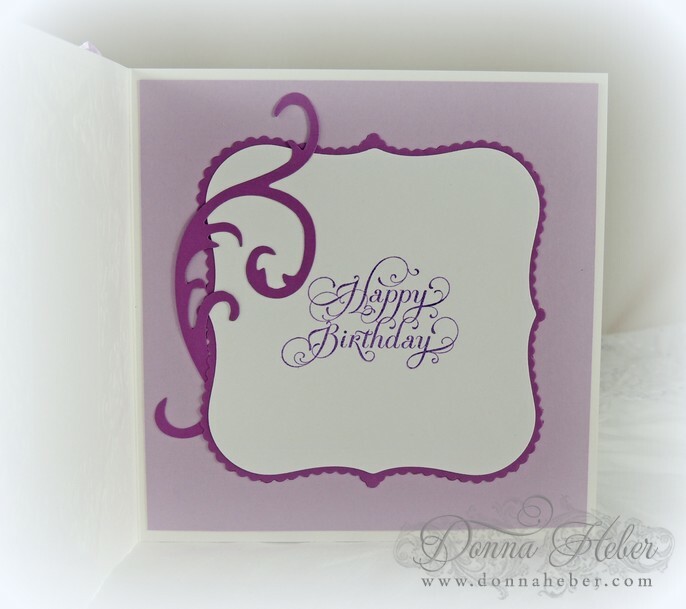 After the layers were stacked, I added an elegant flourish cut from Recollections Purple Passion paper. I finally saw my first robin over the weekend. Spring, get here soon! We saw a robin too which is shocking since we still have so much snow- but I guess they know when to come back! This is so beautifully delicate, Donna. I love it. Have a wonderful day, and Happy April to you! This is stunning Donna. Just gorgeous in white and purple. so beautiful and elegant card Donna. Such a beautiful card! I wish spring would hurry its way along too! You card and design is beautiful. You are very talented. Have a great evening! Well there you are, the little Robin has hopped in especially to tell you Spring is making her way to your house!! Yea this is my last day of full time work, then I'm back to only two days a week - YEA!!! I'll have time to create tooo.